Sculpture (indoor and outdoor) in wood and stone (mainly Mt. 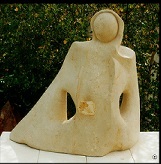 Gambier Limestone) – abstract and semi-abstract style. Painting, in pastel and acrylic. Showroom displaying indoor work – sculpture and woodcraft; paintings in pastel and acrylic. 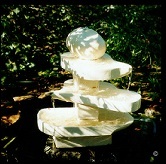 Sculpture garden, setting for outdoor sculpture, fountains, water features. Workshop – equipped for tutoring students of all levels, in carving and sculpting. Artist in Schools Programs – Australia wide. Exhibitions, including annual group exhibition with regional guest artists – held on first weekend in December at home Studio.